The cards are available at most spiritual shops in North America, Australia, and the UK. The Return of Spirit cards are the third deck in the best-selling series by Cheryl Lee Harnish. This set focuses on the personal, emotional, and daily challenges of life. The messages are three times longer than in the previous decks, providing in-depth detailed guidance and explanation. The booklet is now a paperback book in miniature size. What hasn’t changed is the incredible energy of the fractal art, the heart-filled connection with Spirit, and the exceptional quality and love that goes into each deck. Try the cards here! Have an online reading and/or get the code to have the online reading on YOUR site! Walking our path in life isn't always easy. There are times when we need explanation and understanding about what is occurring in our lives or direction as to here we are heading. This stunning gold gilded deck connects to the heart of the reader, providing meaningful and useful guidance. More than just a tool for divination, the cards aid in developing and strengthening our intuition and our personal connection to our Guides. Try the cards! Have an online reading and/or get the code to have the online reading on YOUR site! 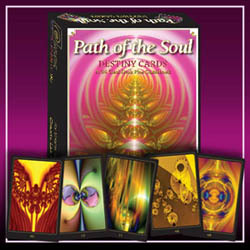 Enjoy the high vibration and loving energy of Path of the Soul, Destiny Cards. Each card contains an intuitively channeled Fractal Art image, which emanates a unique vibration and meaning. 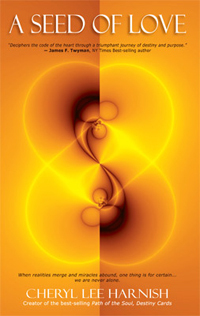 Fractals are one of the “new tools” on the planet today to aid us into Ascension. 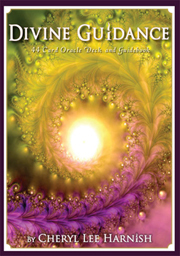 Experience profound spiritual guidance and insight into your Soul’s purpose, inner gifts and spiritual advancement. There are 44 gold-gilded cards in the deck, accompanied by a guide booklet as well. The booklet contains the general meanings of cards along with basic instructions on how to do readings and developing intuition. When realities merge and miracles abound, one thing is for certain... we are never alone. The long awaited book by Cheryl Lee Harnish. It takes courage to follow your heart, find your purpose in life and fulfill your destiny. Sometimes, discovering your gifts is only half the battle. The other half is overcoming the limiting self-beliefs and fears that hold you back. It's time to remember that you are not but one small person. You are a creative Spirit made in the likeness of God. It is time to claim your greatness and your power. It is time to cultivate your Seed of Love in this world. Engaging the heart and soul of the reader using the Native American tradition of story, Cheryl Lee Harnish delivers a powerful and inspiring message of purpose, faith and courage. It's an engaging tale of following the heart, walking the path, and discovering purpose. This emotionally charged and spellbinding narration opens your heart and mind to living your highest purpose and claiming your destiny. Want to know what other's thought of the book? Check out the Reader's Reviews here! 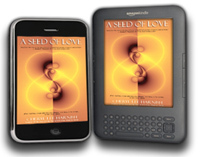 Also available for Kindle reader, and Kindle for Droid, iPhone, BlackBerry and your PC!